In 1780, a seemingly eccentric Englishman almost seventy years old worked out the weight of the world with the help of lead balls, a pulley and a wooden rod: after thousands of hours of measurements and calculations, the result achieved by Henry Cavendish is amazingly precise. In around 1840, a young ship's doctor made some observations concerning the temperature of storm-whipped waves and in the process discovered one of the most important physical laws: Robert von Mayer is not taken seriously and ends up in a mental institution. A brilliant young physicist from Germany is caught up in Stalin's Great Purge: Friedrich Houtermans survives the three years' solitary confinement by working out brilliant proof of properties of prime numbers – merely in his mind because pen and paper were forbidden. 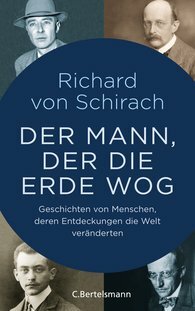 Richard von Schirach recounts unknown, curious, shocking stories of people behind world-changing discoveries; he describes their almost childish raptures, their profound awe in view of the beauty of creation and their sometimes apparently crazy boldness. "Richard von Schirach brings to life the people behind the great names, including all their eccentricities, fallacies, and small-mindedness. A wonderful storybook about geniuses of science."